Featuring on our list of celebrity closets we’d love to raid for desi clothes is Upasana Kamineni Konidela! In this week’s style spotlight we focus on some of her lust worthy clothes that she has been spotted wearing. 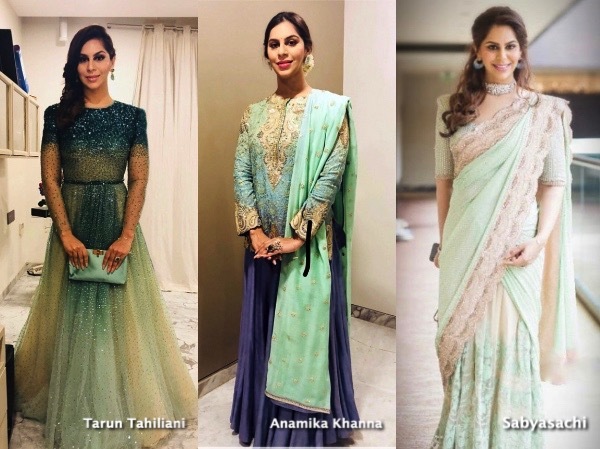 Upasana, who is married to actor Ram Charan Teja and the Vice-Chairman of Apollo Charities, is often spotted in various social events happening in Hyderabad wearing Indian designers. While she mixes the styles up, she seems to be partial to Anamika Khanna, Abu Jani Sandeep Khosla (with whom she is close friends with) and Tarun Tahiliani (who designed her wedding trousseau and is designing her home). While I liked most of her sartorial choices, its the Anamika Khannas that I love! Plus any celebrity who re-wears clothes and repeats their accessories is an instant winner in our books! Tell us, what do you think of her style? Wearing Purvi Doshi separates, Shilpa was spotted arriving back in Mumbai on Friday. It sure was a comfy outfit but am on the fence about the top. Would you wear it? For a recent appearance of hers, Taapsee teamed a Knotty Tales dress with a vest/crop-top by Purvi Doshi. Big earrings and her trusty black ankle-strap sandals rounded out the look. Adding a crop-top to a dress is a good way to breathe some new life in to it. Taapsee made the two work for her! Both Sophie and Karishma were photographed making their way in to the local airport yesterday. Sophie picked a pair of monogramed Pinko denims, one that she teamed with a Topshop top. Her accessories included round Fendi shades, a Chanel bag and pair of Coach boots. Karisma did monogram by way of her Louis Vuitton tote, and she too picked a pair of round shades to top off the look. The look in question-a Purvi Doshi outfit and pair of easy flats. It might be unfair to compare the two looks but Karishma’s easy, fuss-free look instantly stood out; she looked lovely. Wearing a Purvi Doshi top and skirt, Kalki attended promotions for Jia and Jia on Thursday and then the screening of Victoria and Abdul. The top while really cute would’ve fared better with a different bottom. As is, the look just feels like a costume from a filmy dance number. And now that I have that visual, I can’t unsee it. Did you like the separates on her?